Turkey a country in western Asia and southeastern Europe. The vast majority of Turkey is composed of the Asian territory of Anatolia a large mountainous peninsula. The capital city, Ankara, is located there. The rest of Turkey, called Eastern Thrace, occupies the far southeastern part of Europe. This region of rolling fertile hills is home to İstanbul, Turkey’s largest city. Asian Turkey and European Turkey are separated by three connected waterways of great strategic importance: the Sea of Marmara and the straits of the Bosphorus and the Dardanelles. Together, they form the only water route between the Black Sea and the Aegean Sea, an arm of the Mediterranean Sea. The landscapes of Turkey are varied, from fertile plains in the northwest and southeast to broad river valleys in the west to high barren plateaus and towering mountains in the east. In the rugged Asian interior, the climate fluctuates dramatically, with cold, snowy winters and hot, dry summers. Along the Mediterranean coastline the climate is less extreme, with warm summers and mild, moist winters. The history of Turkey is long and eventful, with a succession of ethnically and culturally distinct peoples occupying the region since ancient times. Large cities first appeared in Anatolia during the reign of the Hittites, who invaded the region about 1900 BC. Other groups followed, including the Phrygians, Greeks, Persians, Romans, and Arabs. Nomadic Turkic tribes of Central Asia conquered Anatolia in the 11th century AD and founded the Seljuk dynasty. Their arrival placed the distinctive stamp of Turkish language and culture on the region’s population. The Seljuk dynasty ended in the 13th century after invading Mongols conquered Anatolia. The Ottoman Empire, founded in Anatolia in the late 13th century, endured for more than 600 years and expanded into one of the world’s most formidable empires. At the height of its power, Ottoman territory included much of the Middle East, large areas of Eastern Europe, and most of North Africa. The empire finally collapsed after WWI. The modern Republic of Turkey was founded in 1923 by Mustafa Kemal from Anatolia and Eastern Thrace, the Ottoman Empire’s predominantly Turkish-speaking areas. Atatürk served as president of the Republic of Turkey until his death in 1938. During his rule, he sought to assert Turkey’s identity as a strong, modern, European state. His principles of government, known as Kemalism, remain the guiding principles for all Turkish governments, although they have been reinterpreted by successive generations of political leaders. The most controversial of these principles is secularism. Strict Kemalists interpret secularism to mean that religion should remain outside of public life and that political parties should not promote religious causes. Those who advocate a more flexible interpretation of secularism maintain that religious groups and causes should not be excluded from the public realm. 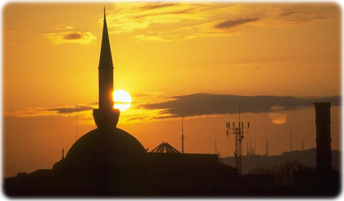 Since the 1950s, the role of religion in politics has been a persistent and contentious issue in Turkey. 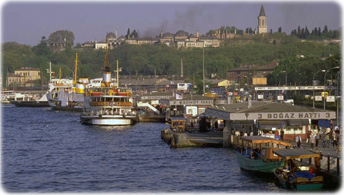 Bosphorus Route (Bogaz Hatti), ferry dock (No. 3) in Eminönü.